It is a perfect app to measure the dimensions of your photos easily. You can save and share your photographs with the help of this app. The photo measures app can increase the productivity of your iPhone camera. It is easy to handle numerous DIY projects because this app has a user-friendly interface. You can quickly record and save measurement on a frequent basis. It is an excellent tool for homeowners and dwellers to take the dimensions of their home. Snap a photograph of any object or your room to get its measurements. Open the photo and swipe on the particular part with your finger that you want to measure. Once you draw a line, you will notice a magnifying glass in the corner of the photo to increase the accuracy. This app can measure a particular area, and you can also insert text boxes to write measurement and important points. It enables you to save measurements in the metric and imperial units. This app often uses the accelerometer of the iPhone to measure the dimensions and distances. You can see video tutorial to learn the use of this app. You can import photos from your camera, email or photo library. This app is available for both Android and iPhone users. The use of PlanGrid can increase your confidence because you can get your whole team on one page. It is available for both Android and iOS mobile devices to enable you to share your plans, reports, photos and markups with the entire project team. You can use PlanGrid with or without internet connection to plan a project. The PlanGrid protects your important data via AES-256 bit back-to-back encryption. Thousands of companies are using this app to protect their drawings and important data. The PlanGrid helps you to save time by reducing the hassle of manual data entry. You can share photos, plans, graphs and progress reports with the whole team. The use of PlanGrid enables you to preview latest changes in a project before finalizing them. It is easy to track all updates of the project and view the history. Constant updates and improvements will enhance your experience. You can track the performance of the whole team and convey latest developments at once by updating this app. PlanGrid can automatically hyperlink the detail callouts of your details. It is easy to download all details of a project in one file. Now you can manage your team work in the field easily with the help of this visual task management tool. It is equally good to use at home and offices to handle your construction, real estate, insurance, facility management and various other projects. You can take pictures, create notes, and plan your projects according to their deadlines. You can synchronize important documents including spreadsheets, PDF files, drawings and blueprints to use without the internet. With the help of Bulldozair, it will be easy for you to manage your projects and collaborate with your team members in a better way. This app is available on the web, Windows, Android and iOS users. The use of BulldozAir can play an important role in the successful completion of a project. It is a free app for your team to manage your projects and share important details for all team members. Save and share your PDF, BIM, Word, Excel and Microsoft Project documents. You can use personalized keywords to categorize your notes and templates. The project data can be synchronized between various devices so that you can switch from one device to another as per your needs. It is easy to insert web links, pictures, and localization in the task. 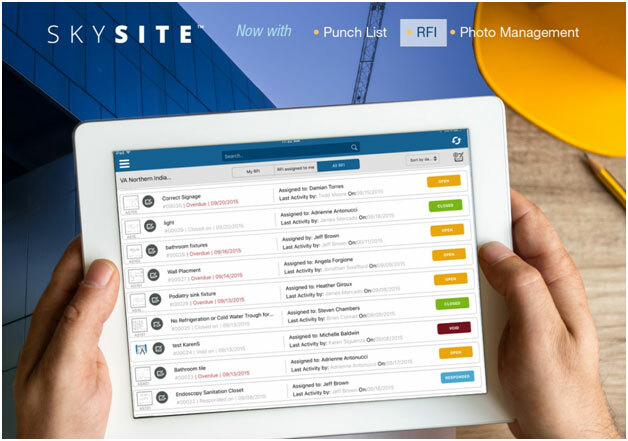 The Skysite is an incorporated cloud-based app to manage construction documents with mobile and desktop synchronization. It is an excellent app for on-site training of your partners and team members. It is easy to use and enables you to manage your budget and activities of your construction project. The use of this app will increase your productivity because you can easily collaborate with your whole team. You can gain maximum control on your project to manage it successfully. To enhance our convenience, the SkySite is available for Windows, Android, and iOS users. You can protect your project details and documents with the help of a password. The SkySite can enhance your collaboration with team members, and you can easily share updates of your project with your team members. Enjoy secure access to the details of your project from any tablet device or computer. The user-friendly interface will automatically increase your productivity. Support all major file formats of construction documents. 24/7 sync between cloud and desktop ensures 100% productivity because your team will always get current instructions from you. Quickly search your required documents, files and information with the help of search tools. This tool enables you to see what is on every floor, ceiling, wall and building. You can view, share and upload photos and floor plans of a particular project. It is an excellent tool for your construction site. The construction webcams offer HD quality videos to view live conditions of your job site. You can get the advantage of 24/7 monitoring to keep an eye on your teammates. With the help of Exact-Built photo, you can get high-quality photos from various angles. The Multivista is available for iOS and Android users to increase your convenience. It is an excellent choice for your construction site to keep an eye on the progress of your project. You can view and identify the photos and floor plans from anywhere without restriction of time. It is easy to upload your own photos and documents for other users. The “Zoom” will help you to inspect documents and images at high-resolution with your mobile devices. It enables you to add comments and annotations to any photograph to highlight different issues in a particular field. Select the photos that you want to share with your teammates or restrict the access of the particular people to any document.